Cinderella Smith is another delightful, irrepressible girl similar in personality and style to Sara Pennypacker’s Clementine and Kay Kelly’s Lucy Rose. Although her real name is Josephine, Cinderella has acquired her nickname because she consistently loses ONE of almost every pair of shoes she has. Each chapter is titled with a different kind of shoe which helps knit the plot with its main character in a unique and effective manner. Pushed out of her usual group of friends by the arrival this past school year of a new student who then spends the summer at dance camp with the girl who has been Cinderella’s closest friend for years, Cinderella finds herself confused, hurt and unhappy. The new school year begins and Cinderella notices Erin, a new student who seems open to and eager for Cinderella’s friendship. We learn one of Erin’s biggest reasons for wanting to be friends with Cinderella is that she assumes because of her nickname that Cinderella must know about wicked stepsisters. It happens that Erin’s mother is remarrying and Erin will be gaining two new stepsisters. Who better to help her determine whether or not they are wicked than a girl named Cinderella? Anxious not to disappoint her new friend Cinderella resolves to help Erin, eventually confessing she has no personal knowledge of stepsisters–wicked or otherwise. Cinderella’s journey with Erin to a new, positive friendship parallels her growing realization that her former friend, Rosemary, is unable to participate in the same kind of give-and-take friendship based in kindness, empathy and respect. The truth about Rosemary’s motives and the unfortunate turn in the girls’ friendship unfold through a conflict over the lead role of Pumpkin Blossom Fairy in their Dance Recital and a lost tap show with a red bow. 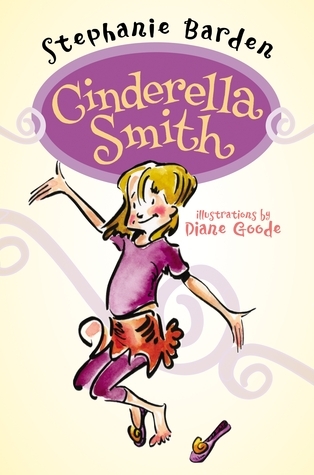 Written in a genuine voice by Stephanie Barden Cinderella is more likeable–in my opinion–than Barbara Parks’ Junie B Jones and will appeal to 3rd and 4th Grade female readers as someone they would like to have as a friend. This is a great independent or read-aloud choice for the 1st through 4th Grade set. A good role model who is bright, intelligent, silly, talented and compassionate, Cinderella Smith is a brilliant (and I think will be an extremely popular choice) addition to the Division I Lovelace nominees for 2013-14.